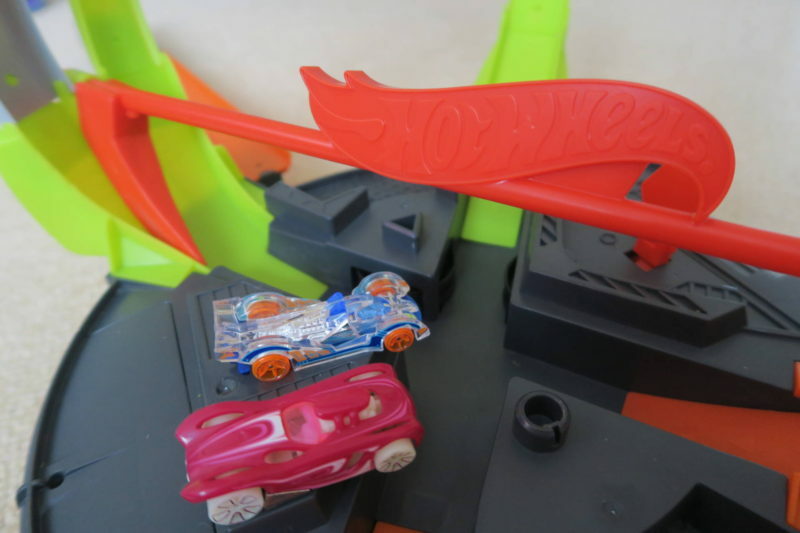 This week we have been lucky enough to review the latest toys from Hot Wheels which as a brand has had staggering success since 1968. The franchise is hotter than ever and now encompasses high-end collectibles, NASCAR, and Formula One models for adults, as well as high-performance cars, track and play sets for kids of all ages. To give you a little background, last Christmas my husband went slightly OTT with Hot Wheels purchases for Jay and since then both have been hooked and have collected a number of cars which Jay frequently plays with. 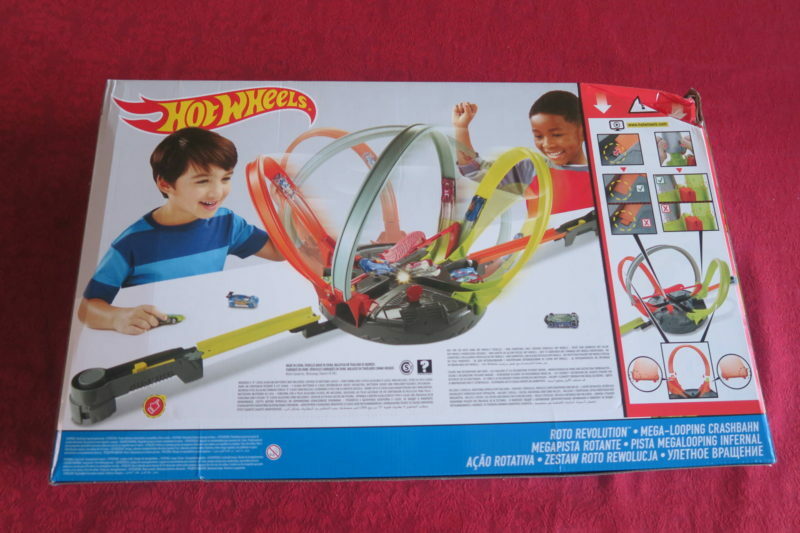 Fortunately for us Mattel got in contact to see if we would like to review The Hot Wheels Roto Revolution Track Set and The Hot Wheels Track Stunt Bridge. The Stunt Bridge post will be up on the blog next week if you’d like to see that too. Toy cars have been a favourite with Jay since he was a baby. He has his favourites of course but he usually asks if I can help him set up the Hot Wheels tracks we have previously purchased as he loves watching the cars launch. 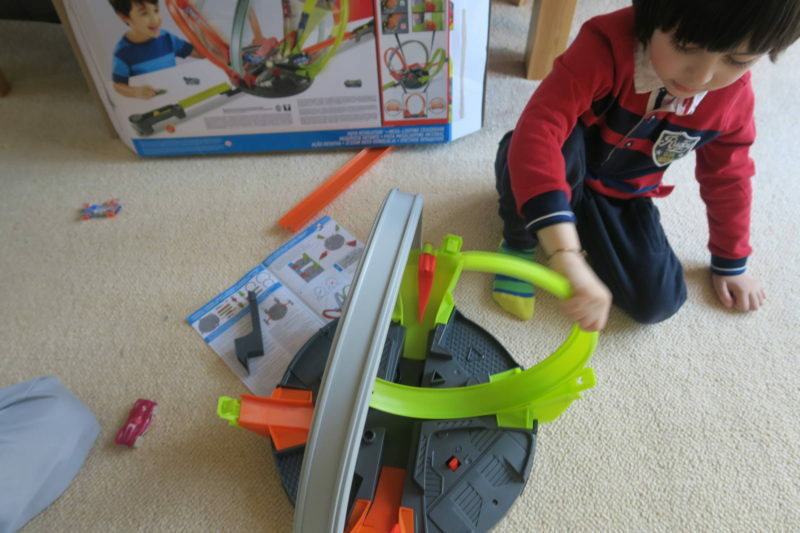 I could tell he was eager to try this set the moment he saw the loop pictured on the box. 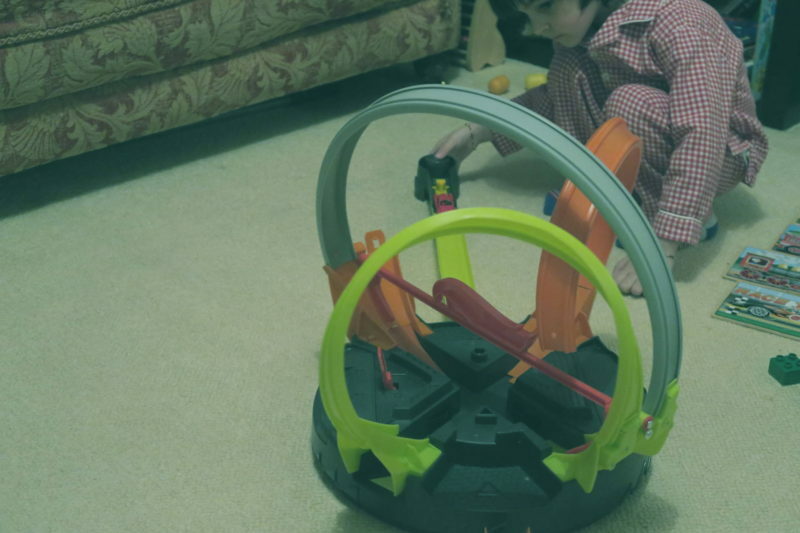 The aim of the game is to strategically launch a car at the right time into the rotating circle. There is a launcher on either side of the track and once both cars are released, they will then loop at speed around the track until one crashes out, the last car racing is the winner. 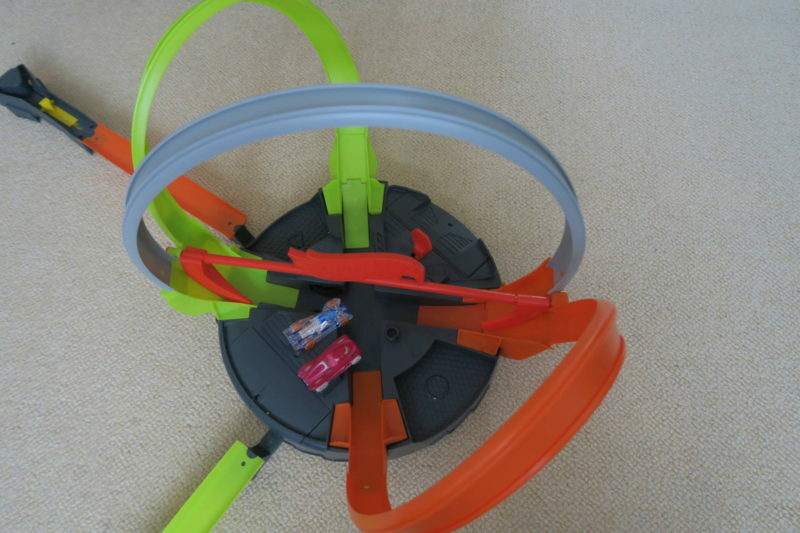 This toy does require adult assembly and is suitable for ages 5+ as it requires hand and eye coordination. I was stunned by how incredibly fast the cars go once they are in the loop. There is an on/off switch should the cars stop and get stuck inside. The first time I operated the loop I hadn’t secured one of the track pieces and a car flew out which startled me but I realised my error. Although I set up the toy relatively quickly which I was really happy about I completely forgot that it takes 4xD size batteries and you’ll need a small cross head screw driver. Luckily I had both but they are needed to operate this toy and one other point I should mention is that I personally thought it was a little noisy once switched on. Jay didn’t seem to mind the noise and once we started playing with the toy it’s easy to forget as the focus shifts to timing the launch of the cars. He is able to place the cars ready for launch and does a far better job than me at getting them to whizz inside the loop! The two cars that come with the set are bright and well made. The RRP for the Hot Wheels Roto Revolution is £49.99 and is available at all good toy stores. 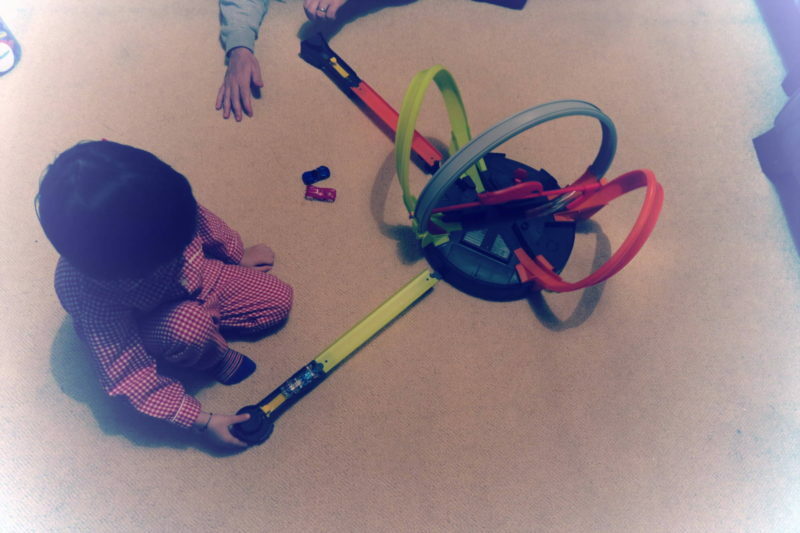 Jay enjoys playing with this track set and even Grandad and Grandma joined in as it has that competitive element to it. With only a few weeks left until Christmas this would make a great gift for any Hot Wheels fan. *Disclosure: We were sent the above toy for the purpose of this review, however, all opinions are my own.